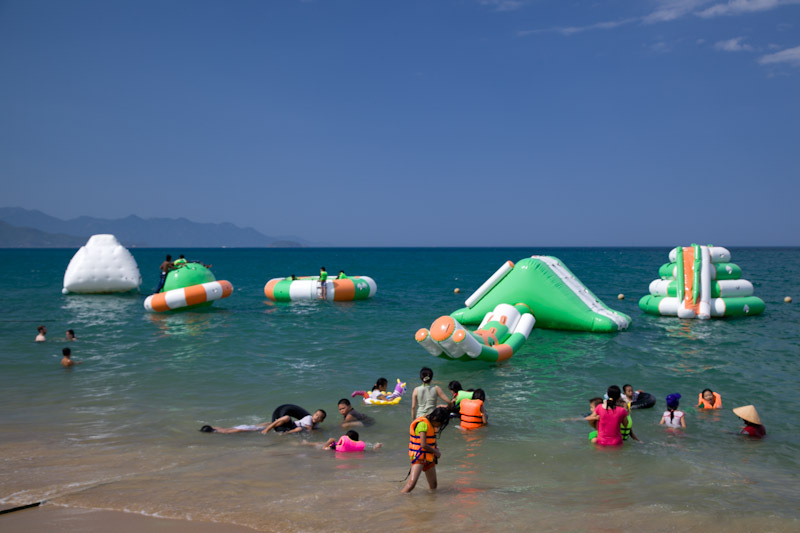 We were told differing stories about Nha Trang by a few travelers, some said it was like a cheesy resort town likened to Benidrom in Spain and some could not promote the amazing beaches enough! So, we were torn when deciding whether to go there or not!?! In the end we felt the need for some proper beach time so we opted to stay for a couple of days! 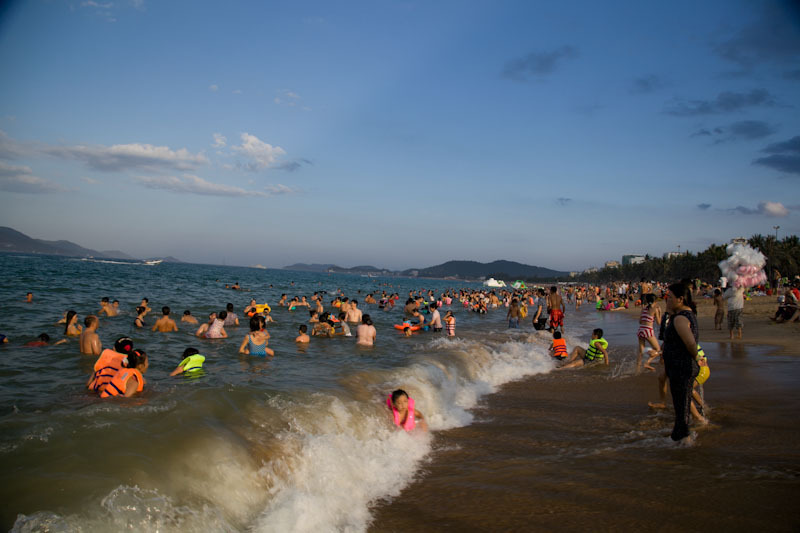 We arrived at about 5.30am into Nha Trang along the main road parallel to the beach; we were greeted by a backdrop I would liken to Waikiki beach. There was a glorious sunrise illuminating the miles and miles of white sand that lined the huge Bay that Nha Trang sat in. But these facts were eclipsed by something else we were presented with! At 5.30am the beaches were packed with people, and when I say packed I mean tens of thousands of people arguably a 100,000 people! It was one of the oddest scene’s I had ever seen and also gave new meaning of the business of a British Beach on a Bank Holiday weekend! It was odd and surreal to us and the fellow travelers on the bus, but not to the locals as I later learnt it was a holiday and this particular holiday was a day people could cleanse themselves, this cleanse started with a a morning dip in the Ocean. Unfortunately I did not manage to get any photographs on this morning, but for the next two days we lived on the beach, we took time to hang out with our new friends, bump into familiar traveling buddies and top up our tan! Like I have written before though life comes to the beach in Vietnam as though it was a local market, play ground or restaurant! We indulged in all things local and all things western whilst enjoying the beautiful beach and sunshine! And who knew there was a micro brewery on the beach in Nha Trang! Who Knew! 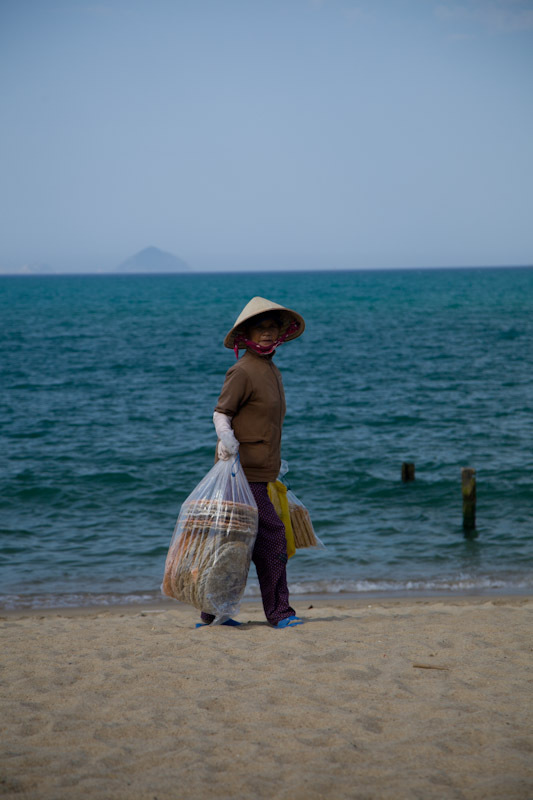 Whilst topping up the brown I indulge in photographing a slice of Beach life Nha Trang Style! I must give a shout out to the trend setting fashionista you see below....She Rocks! !